1. Brush the eggplant rounds on both sides with the olive oil. Mix the salt and pepper together, and use the mixture to season the eggplant on both sides. Place the eggplant, overlapping as needed, in a very large glass or ceramic baking dish. Finely chop the scallions and garlic together to a chopping board. Transfer half of the scallion mixture to a bowl, cover tightly with plastic wrap, and refrigerate. Rub the remaining scallion mixture all over the eggplants. Cover and let stand at room temperature for at least 2 hours and up to 4. 2. Prepare an outdoor grill for direct cooking over medium heat. Brush the grill grate clean. For a charcoal grill, let the coals burn until covered with white ash and you can hold your hand abouve the grill grates for 3 to 4 seconds. For a gas grill, preheat the grill on High, then adjust the heat to 400°F . 3. Place the eggplant on the grill. Keeping the grill lid closed as much as possible, cook until the undersides are golden brown, about 5 minutes. 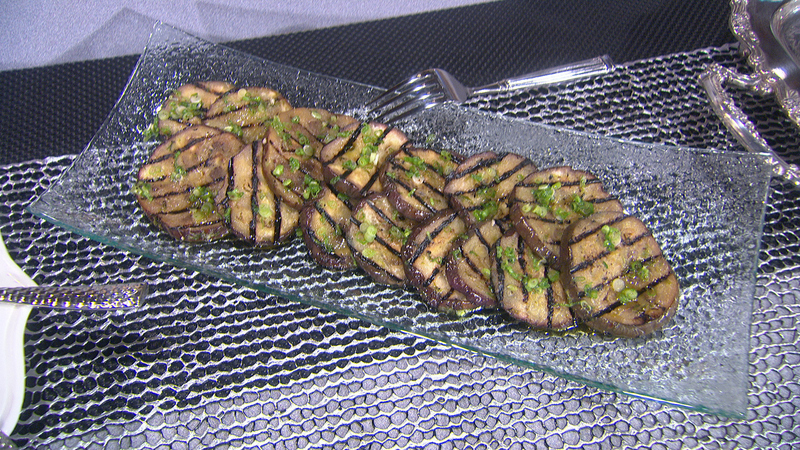 Turn the eggplant over and continue cooking, with the grill closed, until tender, 4 to 5 minutes more. Transfer the eggplant to a serving dish. Sprinkle with the reserved scallion mixture and serve hot.